(CNN) – With nine days until the first presidential debate and candidates vying for the prized bloc of undecided voters, surrogates are playing a game of lowering expectations over which candidate holds the advantage going into the face offs. However, according to a CNN/ORC International poll taken just after the Democratic National Convention, President Barack Obama has a 25 point 59%-34% advantage among likely voters over Republican nominee Mitt Romney when asked which candidate is more likely to win the debates. "Then Sen. Obama had the same edge over Sen. John McCain when voters were asked four years ago who would win the 2008 debates," says CNN Polling Director Keating Holland. "Going back even further in the history books, Ronald Reagan, Bill Clinton, and Al Gore were all seen as more likely to win their debates." While the likely voters think President Barack Obama will have an advantage in the three presidential debates, according to the survey, his campaign surrogates disagree. They cite Romney's primary experience of many debates allowing the opposing candidate the time to hone his debating ability. Lowering the expectations for their guy. Romney's supporters, of course, see a different picture – in fact, that of David v. Goliath. Obama is considered a very strong debater, they remind, and they downplay Romney's experience. Lowering the expectations for their guy. No one doubts the debates will be key however. And the lowering of expectations, as the logic goes, may improve the chances for a perceived good performance after each debate. In fact, it's possible for a candidate to "win" the debate but actually "lose" the debate because they weren't good enough. So setting the bar low is important for both sides. In a CNN/ORC poll taken August 7 and 8, 57% of likely voters say the debates are very important in determining their vote in November while 26% say the candidates' performances are somewhat important and only 15% saying the debates do not matter at all. 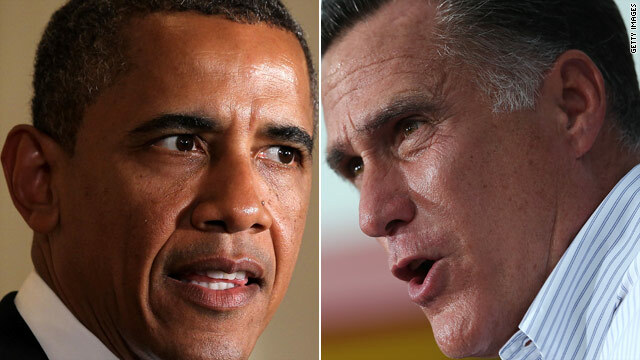 Beginning next Wednesday President Barack Obama and Republican nominee Mitt Romney will appear for the first time on the same stage in a nationally televised debate. The debates are scheduled to be held on October 3 in Denver, Colorado, October 16, in Hempstead, New York, and October 22 in Boca Raton, Florida. CNN Chief Political Correspondent Candy Crowley, anchor of "State of the Union," will moderate the October 16 debate. Vice President Joe Biden and Rep. Paul Ryan, the GOP vice presidential nominee, face off on October 11 in Danville, Kentucky. Republican and Democrats jostled over the presidential debate prospects this last weekend. Obama senior adviser Robert Gibbs said Sunday Romney has an advantage leading into October's contests given the GOP challenger's more recent exposure to the debate stage during the hotly contested Republican primaries. "Mitt Romney I think has an advantage, because he's been through 20 of these debates in the primaries over the last year," Gibbs said on Fox News. "He even bragged that he was declared the winner in 16 of those debates. So I think, in that sense, having been through this much more recently than President Obama, I think he starts with an advantage." But Republican Sen. Lindsay Graham also told CNN's Candy Crowley Sunday that as the weeks wind down to November he expects concerns about the economy will transcend any gaffes or questions about Romney's financial portfolio. "During the debate, we're going to focus on four years of Barack Obama, not everything just about what Mitt Romney may have said or put his dog on the car," Graham added, referring to those who have made noise about Romney taking a family trip in 1983 with his dog in a cage strapped to the top of his car. Republican pollster Whit Ayres said GOP nominee Mitt Romney must use the debates to "score points" on the economy, the No. 1 concern of voters. "The most important thing that Mitt Romney can do is give people confidence that he knows how to fix this economy," Ayres told CNN's Candy Crowley on "State of the Union." "They don't believe (President Barack) Obama has or can, but they are not yet persuaded that Mitt Romney can either. That's the most important thing to come out of your debate." Conservative writer Ann Coulter said on ABC Sunday that the debates are important because voters will see an "unfiltered" Romney, which she says will make all the difference in undecided voters. Though surrogates claim lower expectations for Romney, the former governor must also do damage control over several consecutive weeks of a campaign struggling with gaffes. Former President Bill Clinton said last Thursday Romney's "47%" comment will place a "heavier burden" on the Republican challenger in debates to further explain the potentially damaging comments. Romney made the controversial comments at a private fund-raiser in Florida in May caught on a secretly recorded video telling high-dollar donors that nearly half of Americans would automatically not vote for him because they are dependent on the government and consider themselves "victims." Though he has conceded his comments lacked elegance, Romney was quick to double-down on the remarks, standing by the crux of his argument suggesting an issue of government dependency in the United States. Following an uproar of criticism from Democrats and a wave of wary Republicans questioning the GOP standard bearer's campaign, Republican National Chairman Reince Priebus dismissed the handwringing, insisting Romney had a good week and was in no need of a turnaround. "We had a good week last week, I think in retrospect, in that we were able to frame up the debate last week in the sense of, what future do we want, and do you want, out there for your kids and grandkids. And clearly, things are not going well in this country," Priebus said on ABC's "This Week." But how confident are the candidates in matching their opponent in the fleeting days of September before they match up? Romney has been preparing for the debates intermittently throughout the campaign trail, a schedule Obama traveling press secretary Jen Psaki told reporters on Air Force One marks more preparation for debate "than any candidate in modern history." "They've made clear that his performing well is a make-or-break piece for their campaign," Psaki said of the Romney team's efforts attempting to raise the stakes for Romney. Republican vice presidential candidate Paul Ryan has also been pausing from the campaign trail to prepare for his one chance to spar with Vice President Joe Biden following the first presidential debate. As for Obama, senior campaign adviser David Axelrod said last weekend the incumbent needs to be more concise considering his lack of practice delivering the quick, sharp banter necessary on the debate stage. "He's got to speak shorter, that's all," Axelrod told Reuters. "He just hasn't had to do that for the last four years, so that's a part of the discipline of preparing for these debates." Notwithstanding the campaign rhetoric, polling in battleground states among likely voters underscores Romney's need to shine in the debates in order to not only carry all of the states Sen. John McCain did in the 2008 elections but also win about a half dozen more in order to take office in January 2013. Obama campaign officials said Saturday it is not the national polls but the swing state polls that matter. "We're either tied or in the lead in every battleground state 45 days out," Obama campaign manager Jim Messina told reporters in Milwaukee. "I think you will see a tightening in the national polls going forward. What I care way more about is Ohio, Colorado, Virginia, Wisconsin, etc. In those states, I feel our pathways to victory are there. There are two different campaigns, one in the battlegrounds and one everywhere else. That's why the national polls aren't relevant to this campaign." The CNN poll was conducted by ORC International, from Sept. 7-9, with 1,022 adults nationwide, including 875 registered voters and 709 likely voters, questioned by telephone. The survey's overall sampling error is plus or minus three percentage points, with a sampling error of plus or minus 3.5 percentage points for likely voters. CNN's Dana Davidsen and Paul Steinhauser contributed to this report. to "noto bo" am i reading this correctly? You said mittens is going to blow Obama away in a debate? What in the heck are you smoking. Flip Flop mitt can't speak on ANYTHING without coaching or putting his foot in his mouth..man come on! @Hammerer..living in denial i see. I guess i must be the media. In other words, after the debates, the democrats and sympathizers will tell the public that Romney did worst than expected in the debates AND/OR Obama did better than expected in the debates. This way no matter what is said or done Obama “Won” the debates. Is the American public really gullible enough to believe this? Romney is going to blow Obama out of the water Bo has nothing to run on he can't just say the same thing over and over it's not bushes fault it is his and the crap with Romney and taxes give me a break heard it 23 million times and GM is alive and bin laden is dead I think I heard that 16 plus trillion times Obama you have nothing remember you graded yourself with an incomplete your a failure a zero. People know you will say and promise anything to get a vote. Obama is bad luck for this country just look at the mess our economy is in and prices for healthcare food and gas are all up and will continue to rise with this guy as president. Can't wait till the debates and Romney showes the world what liars BO /biden truly are and how they do not deserve another term! This is the same guy that had trouble with Gingrich, Perry and Santroum in the GOP debates. He even got wipe out by Teddy Kennedy in 1994. Now you really think that Mitts has a chance against Obama. LOL! MItts is just too dumb and is out of touch. He will has no chance of winning. BTW Repbubs. Remember Portman is playing Obama in his prep. This was the same guy that prep McSenile 4 years ago. How did that work out for the Repubs than. Nice try, see ya in 2016!